The Cryogenic SMS series intelligent magnet power supplies have been developed over many years to meet the needs of magnet operators. The power supplies have manual control via the front panel and remote control via the USB interface (other interfaces are also available). This allows the power supply to be linked to read the liquid helium level, software control and safe magnet operation. Standard output ranges are from 60 to 600 Amps. HLG200 The front panel features a self ranging 3 digit LED display, 0 to 1100mm (1mm resolution). Switches are provided for on/off, probe type and pulse interval. HLG210 Similar to the HLG200 but offers additional control features. There are three internally adjustable pre-set levels, easily set by reference to the display. Two drive a 2-pole change-over relay for power switching (e.g. ; to drive solenoid valves in auto refill systems). The third provides a reference point, or can provide output to a persistent mode switch or audio /visual alarm. 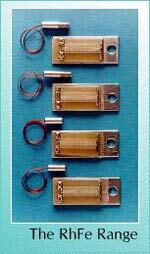 The Cryogenic RhFe resistance thermometers are both robust and stable with temperature cycling. Their response is linear with temperature above 77K and deviates only slightly from linearity below 77K. Hence their sensitivity is almost constant over a wide temperature range. The thermometer can be read directly with any 4 terminal resistance meter or using a simple scanning interface card direct from a computer. Connections to the thermometer can be made using resistance wires with minimal thermal grounding without introducing temperature error. Calibrations are 3-point (RT, 77K & 4.2K) as standard or 30 point as an option.